A Block of Alleys, 2005. 6 x 9.5 x 2 in. closed. Etching and letterpress printed, edition of 10. 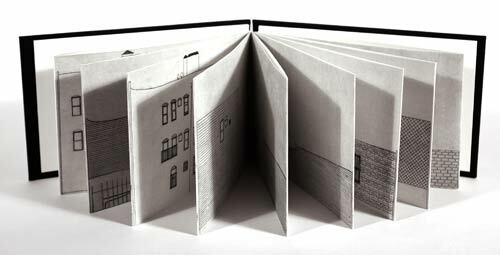 A Block of Alleys is an accordion-style book which depicts all of the alleys in one block in Queens, New York. The buildings on each side of the alley are facing one another, so the city block is paged through, alley by alley, as the book is viewed.